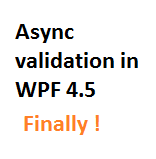 Here is the first post of a serie about the new features of WPF 4.5. Validation of data is often if not always necessary in modern applications. From a long time, WPF provided the IDataErrorInfo interfaces which permitted the automatic validation of your properties. Silverlight, with is asynchronous philosophy provided the INotifyDataErrorInfo which performed the same thing but asyncrhonously. 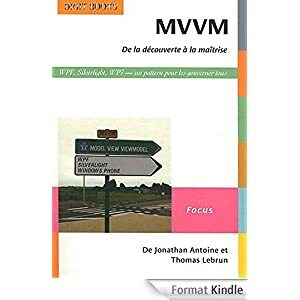 It is a newinterface of WPF 4.5 and we will discover it in this post. ErrorsChanged: an event which must be raised when new errors – or the lacks of errors – is detected. You have to raise this event for each property. As a note, if you return false in the HasErrors property, the binding will act as if there were no errors, even if they exists. With the traditionnal IDataErrorInfo, you have to set to true the ValidatesOnDataErrors property on each binding to your object. There is nothing really new under the sun because this time you have to set the ValidatesOnNotifyDataErrors property to true. The binding will then register itself for the ErrorsChanged event of the binded Person. Eeach time this event is raised for the binded property, the controls will dress itself to display an error. As pointed out before, this is done only if the HasErrors is set to true. I have implemented a delay in the validation of the Person class. The validations occured after each set of any properties but it is delayed by ‘WaitSecondsBeforeValidation’ seconds. The demo application can be found on this Dropbox folder. Don’t forget to register yourself on dropbox using this link 🙂.